Welcome to my very small Freevo Page ! I just rediscovered this page on my computer. I'm sorry to disapoint you,i but the whole informations, carefully collected and checked at the time, are a little old now. I just see that all files are from 2007 (ten years old...). I went in the process of removing this whole stuf, but, surprinsingly, there are still some real connections (not only robots). So I let all in place (for now), but be warned : my last freevo box (the second after the picture you can see here) burns at least 5 years ago ! I'm not totally sure that all links still work :) Beside that, happy freevoing ! I'm a very new fan of Freevo. 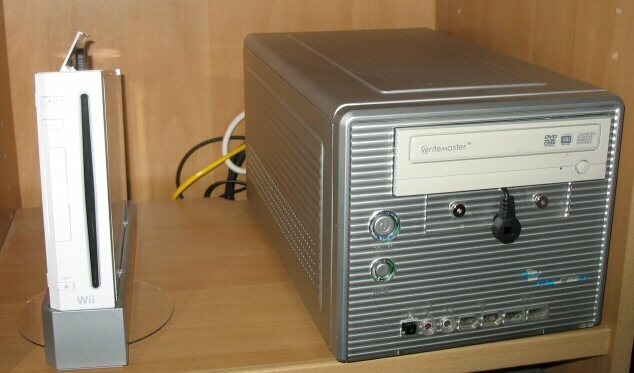 Frevo is a Linux HTPC software, who permit to transform a very old blaterred computer into a vonderful Home Theater PC ! This page is build with the design of the freevo web interface (Someone could say : a poor copy :-) ). It was build in a very short time. I dont want (nor be able) to create a reference page for freevo. I only did this page to put some personal experience about Freevo. You can also find a page explaining how I configured my PVR-350 on my freevo HTPC.